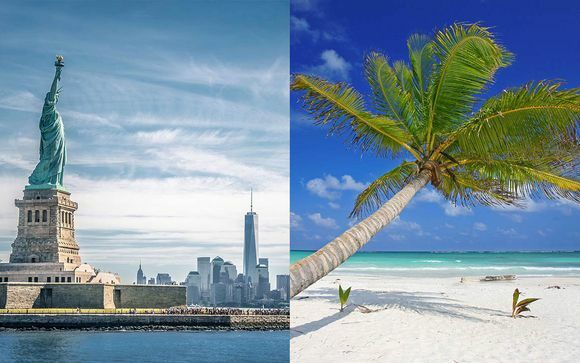 Our New York travel guide for unforgettable holidays up to -70% off To take advantage of these offers, join now for free! Discover the Best of New York City with our Travel Guide. Best plans, locations, restaurants, hotels to visit the Big Apple. Everything you need for unfogettable holidays. 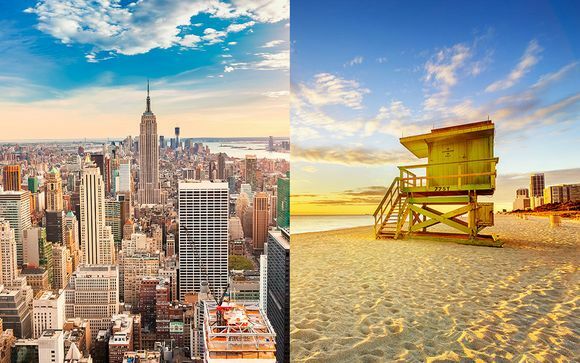 Bursting at the seams with fantastic restaurants, amazing shopping destinations and breath-taking views, New York is not a city to miss when you’re planning your next visit to the USA. With a melting pot of countless cultures within a few blocks of each other, it’s no wonder this vibrant, beautiful city is the location that has inspired countless artists, photographers and fashion designers. Whether your thing is late-night diners or all-day shopping adventures, endless galleries or on-trend events, this city has it all and more. Take in the sights, experience the nightlife and enjoy copious shopping opportunities in one of the biggest and busiest cities in the world. Take in American history with this classic tourist attraction. 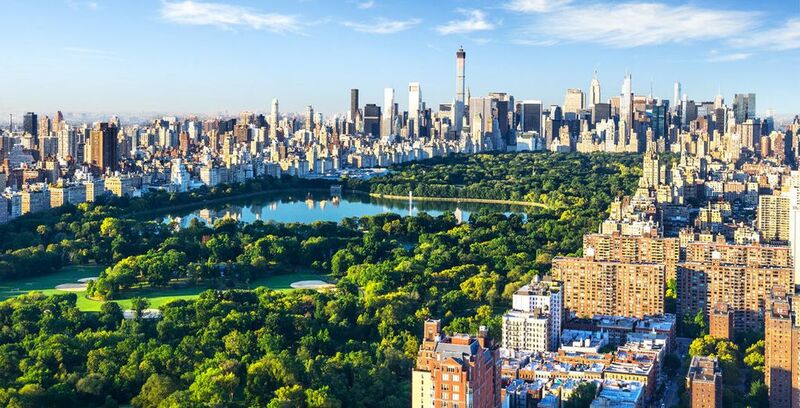 Enjoy greenery in the city with thousands of events held in Central Park every year. 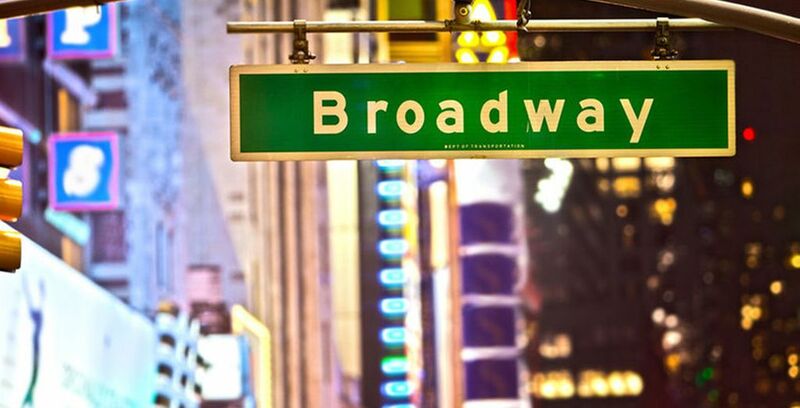 Visit the heart of NYC - hundreds of shows to see and places to explore. Take in the city from above with a view you'll never forget. Enjoy the best art NYC has to offer with a visit to the MMoA. Discover the gateway to NYC at Ellis Island. Visit one of the classic landmarks of the city. Explore the 5th Avenue with all the luxury boutiques, unique stores and attractive products NYC has to offer. Get into the spirit of New York City with baseball. Enjoy modern art in luxurious surroundings at the MoMA. 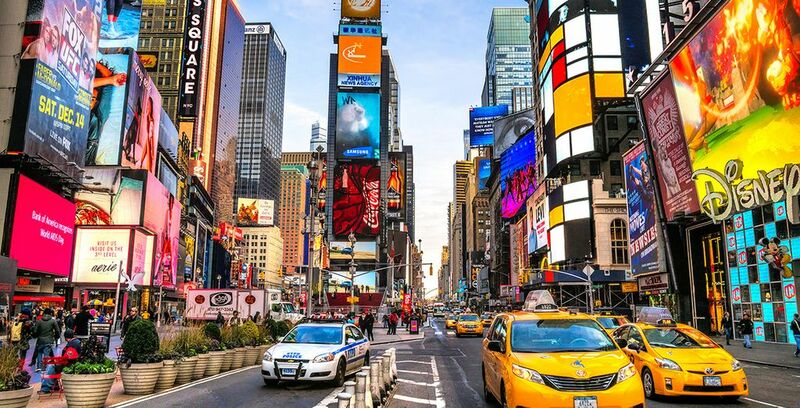 As one of the busiest and most bustling cities in the world, there’s never a bad time to visit New York - it’s all about what you want to experience during your visit. With year-round attractions and all-night events, you can make your decision based on some of the cities’ more seasonal attractions. Visit the winter carnival and go ice skating in the colder months, or chill at outdoor events and music festivals at the warmer times of the year. Just be sure to pack appropriately for your trip, with winters being icy and freezing while summers can leave you hot and bothered. Whatever time of year you choose to visit, there's always a lot on - but Christmas can be a particularly magical time to get to know NYC. 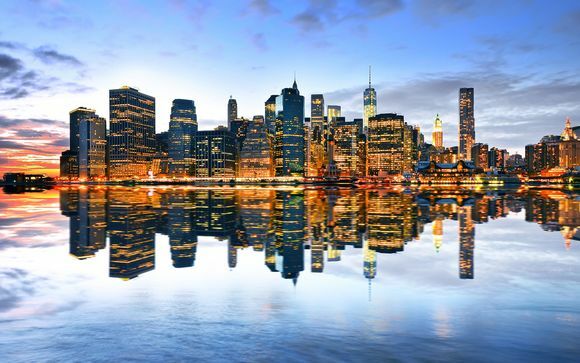 It’s never been easier to get to this number one tourist destination, with flights available to New York’s JFK airport from around the globe, often without the need to change flights, and with a smooth and easy transition from airport to city. 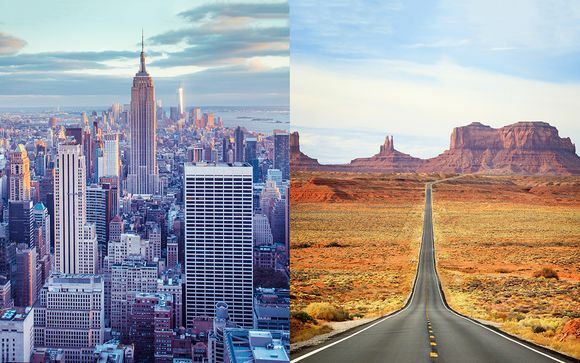 For those looking to include NYC on their next cross-country adventure, plenty of buses, trains and domestic flights are available - and for those who prefer to be behind the wheel, driving to NYC is easy - just watch out for parking costs. With an excellent central location and stunning interior, this four-star hotel is perfectly situated to explore everything NYC has to offer in a luxurious package. Just a short stroll from Fifth Avenue, Central Park and Times Square, this hotel isn’t quite in the hustle and bustle of it all - but close enough to deliver an exciting break. Experience New York living for yourself with this towering hotel structure, offering unparalleled views of the cityscape that will take your breath away day or night. Right in the heart of the Manhattan action, this four-star hotel is ideally placed for shopping excursions, theatre trips and more. 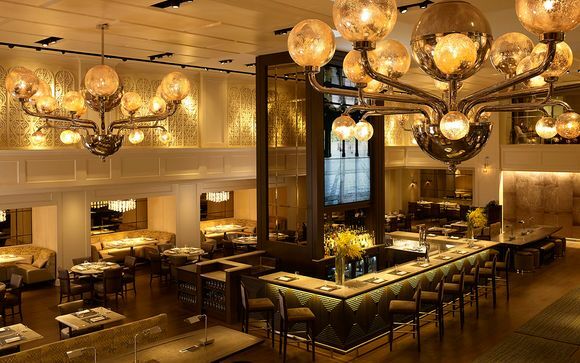 A regular feature in Vogue, this stylish and luxurious hotel has it all if you’re looking to see NYC in style. Just one block over from the Empire State Building, this beautiful accommodation is perfect for the more sophisticated sightseer, with a four-star rating that will make you never want to leave. A central hub for arts, fashion and culture, there’s seemingly nothing you can’t do in this vibrant and lively city. Many festivals and events are held in NYC throughout the year both for local consumption and for the entertainment of visitors and tourists, from galas at museums and galleries to street festivals in Central Park and other green spaces. In NYC, there’s always something to see and do. Often, the reception at your hotel will be able to inform you of local, smaller events to attend once you arrive - so it's always worth asking. With such an array of cultures on every block, there’s a huge variety in what you can bring back from this style-rich city. From beautiful clothing to amazing artwork, novelty gifts based on famous landmarks and even unique vintage items picked up from New York’s many thrift stores, you’ll need an extra suitcase for all the shopping you’ll be doing. Whether you're a fan of clothing or love furniture, there are plenty of shipping companies in NYC that can help you get those prized new possessions back home without taking up all of your baggage allowance. As in the rest of the USA, the currency of New York City is the US dollar, and the majority of debit and credit cards will be usable in this location. Cash can also be converted to dollars from pounds before visiting NYC, in order to make your visit even easier. The time difference between the UK and New York City is a respectable 5 hours, which can lead to some jet lag and tiredness following travel - just remember to set your watch to the right time when you get there. The primary language of New York City is American English, though this may vary according to the area of NYC you are visiting - with people from all over the world visiting New York City every day, you’ll likely hear many different dialects and languages each day. When visiting NYC, it’s important to pack for the time of year you’re visiting - with cooler clothing for summer and something to wrap up warm in the winter months, when there is likely to be snow and ice. Beyond that, just about anything goes in NYC. A huge and sprawling location, a week is often not enough to properly explore and discover all that New York City has to offer. A recommended stay is at least two weeks to properly soak up the atmosphere, enjoy all the galleries and museums and fit in every bit of sightseeing you can - not to mention all the different restaurants and shops to visit. New York City features a wide variety of restaurants from Indian to Vegan, Chinese to Mexican and a huge amount of fusion or unique restaurants all designed to give you a one-of-a-kind experience. NYC is also famous for its street food, with festivals often including food trucks and snacks, and delicacies available from street carts in locations like Central Park. There’s something to do for everyone in NYC, with tourist spots and locations suitable for all ages, as well as countless activities to do with younger children in Central Park. Teenagers will love the vast shopping options, and many galleries and museums are child-friendly and accessible to all. New York City: What budget to plan? Depending on your reason for visiting, there are a wide variety of different budgets you may want to adhere to for your next visit. For anyone looking to enjoy the variety of shops available in NYC, copious amounts of spending money must be brought along - as well as extra suitcase space. As a capital city, the cost of living as well as restaurant and store prices can often be higher than elsewhere - so plan accordingly by bringing more than you’d expect to spend. Known for its stunning skyscrapers and dense, colourful neighbourhoods, the environment of New York City is very much that of a bustling, busy and vibrant city, with small amounts of space such as Central Park given over to greenery. If you’re a fan of open space and wide skies, then NYC might not be the place for you - but those green, leafy spaces can make all the difference and bring you back to nature. If you’re planning to travel to NYC from the UK, make sure you plan accordingly when it comes to adaptors for your phone chargers, as well as all the clothing essentials. 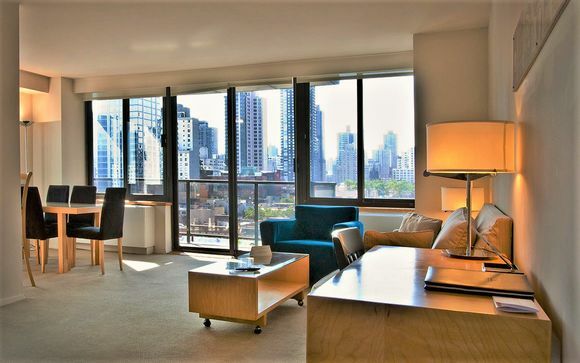 While many amenities are available close by at all times, it may be better value for money to pack more than you think you need to avoid those expensive NYC prices. It’s also a good idea to plan your visit ahead of time, to make sure you can fit in all the activities and sights and make sure you have time left to enjoy the city itself. Discover our offers in New York City: great deals to New York, last minute holidays to New York, New York city breaks, holidays to New York, tours in New York, weekends in New York. Discover our travel guides and or deals to the USA: great deals to the United States of America, holidays to the to the United States of America, stays in the United States of America.